For quite a time, I had been wanting to go back to Croatia to see first hand what this young nation with ancient roots had to offer, both below and above the surface. Back in the 1980s, in the days when Prince and Michael Jackson were the dominant figures in popular music, I went there on a camping trip. It was before my diving days, but the pristine archipelago with its brochure-like, clear, turquoise waters was forever, clearly imprinted in my memory. The Romans called the Mediterranean Sea, Mare Nostrum—our sea—which signals some degree of proximity and relative ease of access, at least if you live in Europe. With all the hassles at airports these days, the long waiting lines, intrusive security and still tighter restrictions on luggage allowances just getting worse over time, destinations that I could possibly drive to rather than fly to were starting to look more and more attractive by the day. In this case, I ended up flying anyway, but at least I stayed within the same time zone, so no jet lag. As I, one late summer day, once again stepped out into Dalmatia—the historic region of Croatia that makes up the central part of the eastern coast of the Adriatic Sea—I was greeted with a landscape that had been baked all summer long by the scorching midday sun. There were lots of browns and yellows, colours of the soil and dried underbrush under the dusty green foliage. Villages nestled between orchards of olive trees covering the rolling hills were generally made up of quaint, white cottages and villas with red, tiled roofs. In the distance, totally contrasting in colour and texture, I could see the glittering sea. It was the same turquoise colour I so clearly remembered. 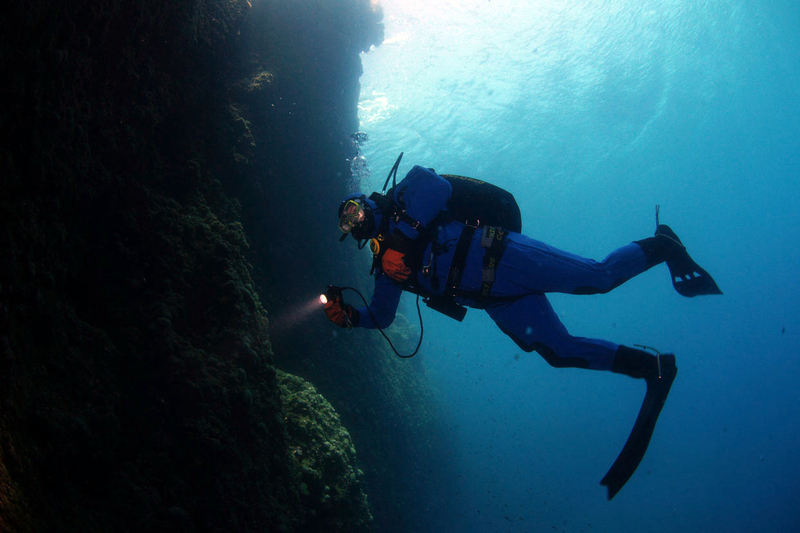 Nautilus dive center is conveniently located in the picturesque, little fishing village of Jezera on the island of Murter from where the stunning archipelago, including the marine reserve of Kornati National Park, is easily reached by a short boat trip. The village clearly caters to a lot of tourists during the summer but not in an intrusive way; there are no major hotels or resort complexes, just a bustling harbour fringed with restaurants, boutiques, ice cream stalls, and booths selling jewellery and cheap souvenirs. There was a small hotel, but the most common form of accommodation offered to tourists were rooms and small apartments rented by local owners of private villas. So, we ended up with a local family who offered us a comfortable private apartment with a big balcony overlooking the port and the family’s lovely garden full of fig trees hanging heavy with fruit. Booked through the very helpful and friendly staff of the Bisage Travel Agency in the center of town, Apartman Irena (www.murter-apartmani.net) run by Karlo Klarin and his family, was just a short walk to the marina and Lucica Beach. Karlo was, fortunately for us, also an official tour guide and native of Murter Island, with a wealth of information on the culture, history, attractions and activities of the island and fluent in no less than five languages: English, German, Italian, Czech and Croat. The dive center is located right on the harbour front, not in a shop but in a building that was probably a converted warehouse of some kind. But no matter, it did the trick. There was ample space for storing kit in there and a sitting area with wi-fi, so you could enjoy a cup of coffee while uploading the day’s harvest of images to Facebook. The dive boat was huge and very spacious. It was a fishing trawler of sorts, the size of a small Red Sea liveaboard, albeit not very fancy but with a large upper sun deck with benches and tables and room for at least a couple of dozen people. 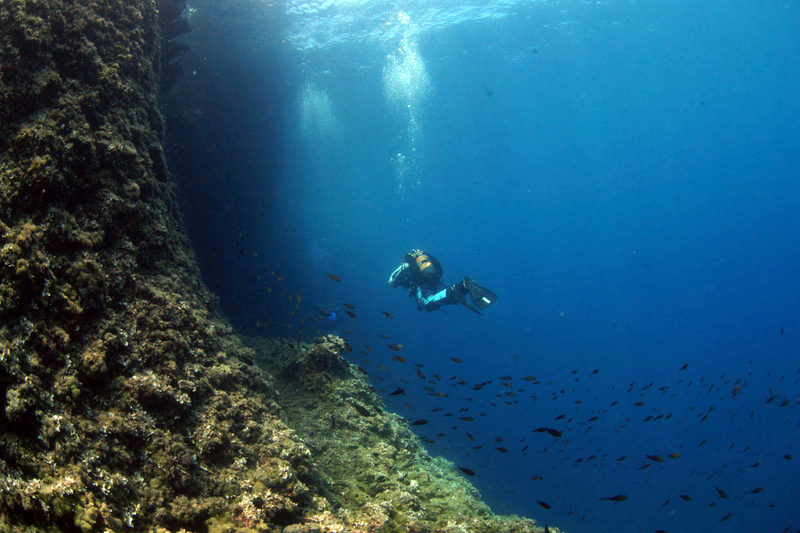 We steamed out towards open sea with a mixed crowd of divers and some of their families. At one of the tables, a couple of kids were totally absorbed playing with their Gameboys, while at another table, a team of divers were meddling with their cameras. There was a soothing, relaxed atmosphere. 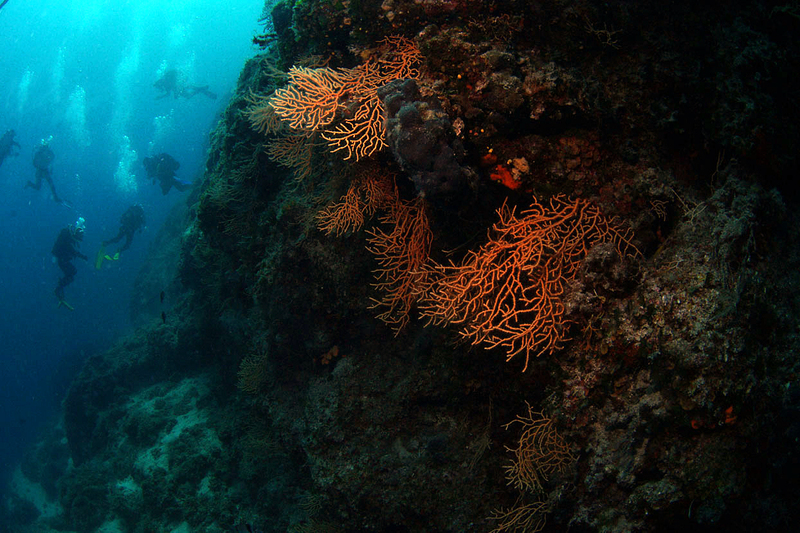 Just getting to the dive sites felt like a mini-cruise, as the vessel wove in and out of the many islets en route. 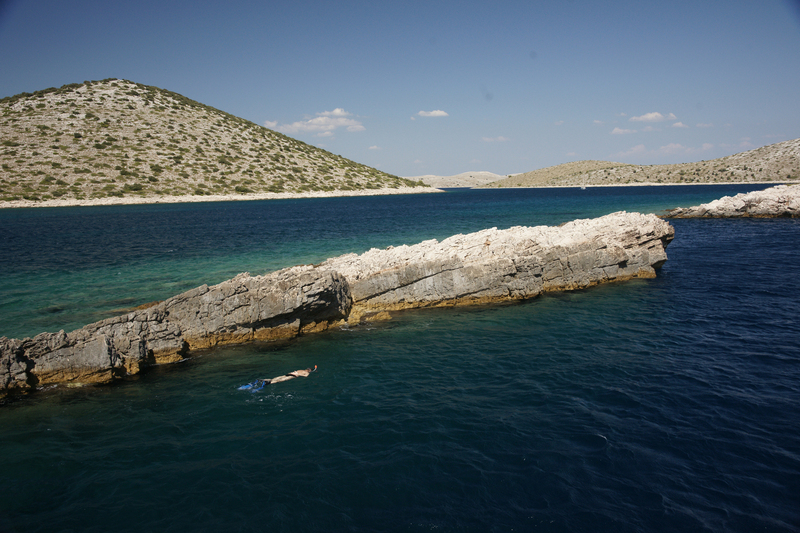 The blue sea was dotted with leisure crafts, motorboats and sail boats, as we headed out towards the Kornati National Park.